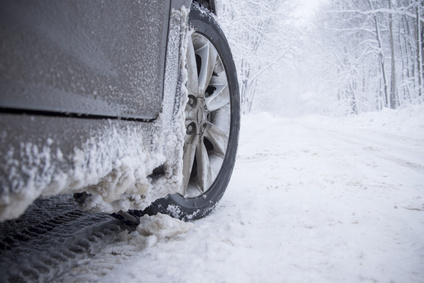 If you have ever driven in the winter and suddenly lost control for no reason, you probably experienced black ice. The road looks perfectly normal but all the driving skills you learned over the years and the advice you have been given, doesn’t matter much as you slide across the highway out of control. It may be viewed as a dramatic comparison but working with Duroid is a little like driving on black ice. When beginning work with a new material, you try to do as much research and get as much advice as possible. You download the manufacturers documentation and talk with the manufacturers representatives, drill/router bit manufacturers and other PCB manufacturers who have worked on the material in the past. After compiling all this information, a manufacturing process is developed which fits both the material and your own facility. Normally these precautions are enough to ensure success but one material, Duroid, requires significantly more attention. To begin, the laminate manufacturer freely admits the material will move, but only during the etching process. The key they state is to first etch 80% of the copper, cure the material in an oven, then provide a final etch and a final baking cure. So two films will be required for etching instead of one and it will require extra time in the ovens. Easy peasy, right? The panels look normal and with almost 3 decades of PCB manufacturing experience to back you up, what could go wrong? The panels go in for first drill followed by imaging and you know immediately the process is starting to go sideways. After inspection, you determine the panel has shrunk by 0.012” over a length of 18”. To convert this into a PCB manufacturing perspective, you’re in the ditch already and you haven’t even rolled into the etching department. All the prepared films and files are discarded and remade to compensate for the new shape and the panels go into etching where they shrink a further 0.008” but the aspect ratio is also off. 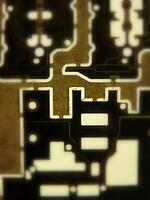 The panel isn’t shrinking in all directions at the same rate, the traces are not etching at the same rate either. In fact, each half of the panel will require two separate drill files. It’s a wreck with a lot of time and expensive material to write off. Determined to learn all you can, the panels go in for final drill/rout. The CNC equipment feed and speeds are reduced to the provided specifications. These equipment adjustments along with double fluted end mill bits (in place of standard chip breaker bits) and dedicated holders are all recommended to help prevent costly rework labour time at the end of the process. However, the random strand feature ensures ragged edges are inevitable. You can feel your momentum slowing as the final suggestion from the tooling rep is to clean it up by hand. We have learned that each design with Duroid requires at least one sacrifice panel and you can’t count on subsequent panels to behave in precisely the same manner. With prices as high as $100 per square inch, it’s a bit like putting tire chains on your luxury car. You may have increased your level of control but your speed is severely limited and you still run the risk of something coming loose and tearing a fender off your Bentley.